With the intention of making your visit at Gizeux an exceptional experience, we offer various activities that will embellish your stay according to your wishes. 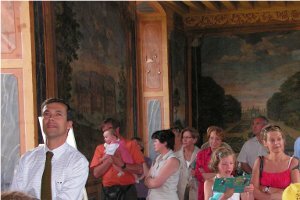 The château of Gizeux is happy to welcome groups above 20 people all year long. Booking advised (phone number: 00 33+ (0)2 47 96 45 18). 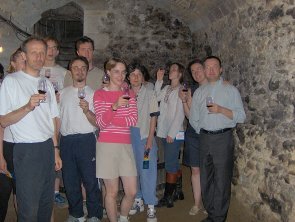 Because the Château de Gizeux is located close to famous Bourgueil and Saint-Nicolas de Bourgueil vineyards, we suggest you have a taste at our local specialties and wines in the castle's cellars. A wine grower or the owner will guide you through the tasting to help you discover and appreciate the originality of our region’s wines. An introduction to oenology will be followed by a sale of the tasted wines. 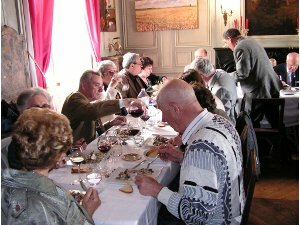 Extend your visit by having lunch or dinner at the castle...For an enjoyable and unforgettable time with family, friends or business associates, the Château de Gizeux offers you a variety of menus and aenjoyable atmosphere. For menu details, please contact us via e-mail.